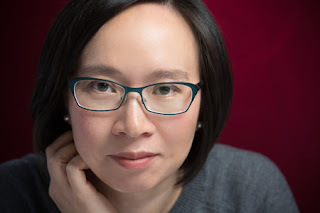 Today I'm so excited to be chatting with the remarkable Malinda Lo about A Line in the Dark, her newest book and one of my favorite thrillers of the last few years. It's a sinister mystery about girls in love with girls, toxic friendships, and murder, of course. I got to ask Malinda a few questions about her book and her writing! Stick around to the end to enter a giveaway and to learn more about the book and author!!! Let's start off with a quick one. 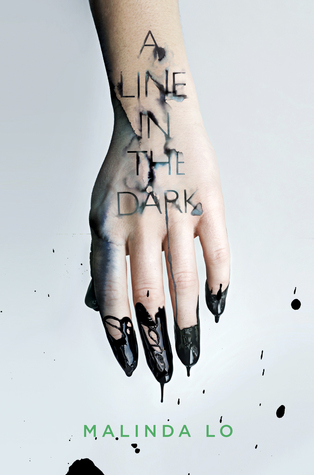 Give us five words that best describe A Line in the Dark. Tell us a little bit about Angie and Jess. What are they like? Jess Wong is a comic book artist who has a secret crush on her best friend, Angie Redmond, whom she thinks of as the perfect girl next door. Angie is openly queer but has never had a girlfriend, and she really wants one. Which one is more similar to you and why? Superficially I’m more like Jess, because she’s also Chinese American and a storyteller, but she’s not very much like me in reality. However, I’ve felt like every single one of the characters in A Line in the Dark at some point in my life. That’s the great thing about being a writer — you are inside the head of every one of your characters, even if they’re completely different from you in reality. What are your favorite YA books featuring f/f romances? I love YA books that have complicated relationships between queer girls, although they’re not always capital-R Romances. I love the relationship between the two girls in Nina LaCour’s We Are Okay because it feels so realistic for a first love. I also really love the romance between Pen and Blake in M-E Girard’s Girl Mans Up. They have so much chemistry, and their relationship is sweet and awkward and fun all at once. What thing do you most hope readers take away from reading A Line in the Dark? I want them to be on the edge of their seats. I hope I keep them guessing until the last page! Thank you so much for joining us on Sarcasm & Lemons! Enter for a chance to be one (1) of three (3) winners to receive a hardcover copy of A Line in the Dark by Malinda Lo. (ARV: $17.99 each). NO PURCHASE NECESSARY. Enter between 12:00 AM Eastern Time on October 16, 2017 and 12:00 AM on October 27, 2017. Open to residents of the fifty United States and the District of Columbia who are 13 and older. Winners will be selected at random on or about October 30, 2017. Odds of winning depend on number of eligible entries received. Void where prohibited or restricted by law. "Gone Girl meets Mean Girls" = perfect! Malinda is new to me, but this book sounds awesome. I love YA thrillers/mysteries. Thanks for hosting! I loved We Are Okay it's my top f/f favorite! I like watching Mean Girls and read Gone Girl it's not my favorite book from Gillian Flynn but still enjoyed it. I read We Are Okay about a month ago and enjoyed this book very much and the relationship felt true to life. I love being kept on the "edge of my seat" and never being able to guess what's going to happen.